25 Gigabit Ethernet emerges as the shinning star. It provides another solution (10G-25G-100G) migrating to 100 Gigabit Ethernet. But for those who just want to use 40G network instead of 25G at present, then they need to upgrade from 10G to 40G connections. As to the migration from 10G to 40G, this article will introduce a cost-effective solution – 40G QSFP-40G-SR-BD transceiver solution. Fibre cabling infrastructure of 10G and 40G transceivers are different. 10GBASE-SR transceivers require multimode fibre (MMF) cable with LC connectors. While QSFP-40G-SR4 or CSR4 transceivers connect with MMF ribbon cable with MPO/MTP connectors. It means that 40G connectivity can’t reuse the 10G network cabling infrastructure. That causes great cost. Except the connector type, there is another concern. 10GBASE-SR transceivers require 2 fibre strands per 10G link, while QSFP-40G-SR4 and CSR4 transceivers need 8-fibre strands (actually it’s 12 fibre strands.). That is because 40GBASE-SR4 and CSR4 transceivers use 4 parallel fibre pairs (8 fibre strands) and each pair at 10G for total 40G full duplex. In this case, 4 fibre strands are not used and wasted. As a result, the connector’s change and the increased fibre density required for QSFP-40G-SR4 need a significant cable plant upgrade. That makes it expensive for pmmfeople to migrate form 10G to 40G network in their existing data centres. QSFP-40G-SR-BD is a short-reach transceiver that delivers 40 Gbps over a duplex OM3 or OM4 MMF connection. This connection can reach the distance up to 100 meters over OM3 MMF and 150 meters over OM4 MMF. This 40G transceiver has two 20G channels. Each channel transmits and receives two wavelengths over a single MMF strand. So the transceiver supports connections over a LC duplex MMF cable. It may be not so intuitive that QSFP-40G-SR-BD solution can save more cost than the traditional 40G transceivers. Let’s take a look at the following case of upgrading 10G to 40G network and compare the cost of two kinds of solutions. In an unstructured cabling system, devices are connected directly with fibre cables. This direct-attachment design is suitable for short distance connection in a data centre. 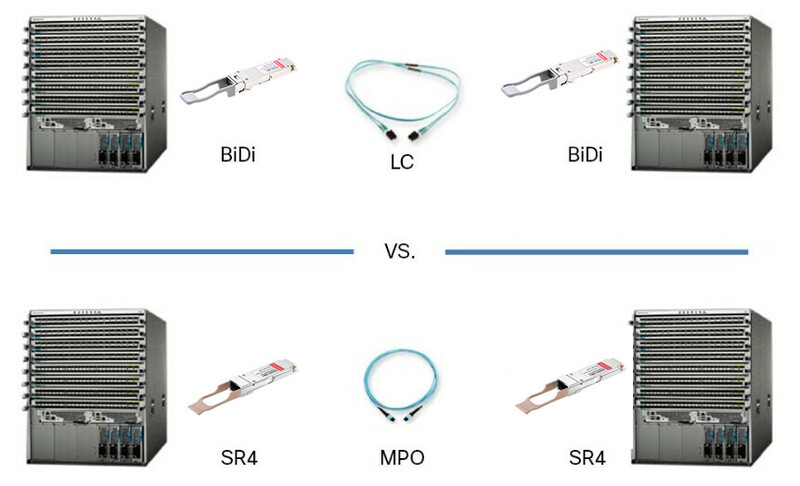 From the figure, it shows that the QSFP-40G-SR4 uses MPO connector and QSFP-40G-SR-BD uses LC connectors. Therefore, with QSFP-40G-SR4, to realise the migration, all of the existing 10G MMF cabling infrastructure should be replaced because the connector are different. But it’s another case to QSFP BiDi transceiver. The existing 10G MMF cables can be reused to achieve the network upgrade from 10G to 40G. This doesn’t require any cost on cables. In the table, the cable costs and savings of migration and new deployment of 288 direct connections. To migrate the existing 288 10G to 40 connections, FS.COM QSFP BiDi transceiver doesn’t need any cost on cable. Compare to QSFP-40G-SR4 , QSFP-40G-SR-BD can save the cost by 100%. For the case in which 288 new direct 40G connections are needed in addition to the existing cabling infrastructure for a data centre migration, the savings can reach as much as 82% with the use of QSFP BiDi transceiver. This above costs doesn’t include that of installation. It’s not hard to imagine the installation cost of QSFP-40G-SR4 connections would be much higher. 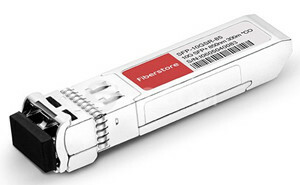 QSFP-40G-SR-BD is a new breakthrough in 40G network. It helps the users to realise the migration from 10G to 40G without the need of replacing all 10G cabling infrastructure. Actually, compared with solutions of some other companies, FS.COM QSFP-40G-SR4 is already cheap. Since we devotes to serving our customers with the most cost-effective network connection solutions, we would like to introduce QSFP-40G-SR-BD. This entry was posted in Fiber Optic Transceivers and tagged 40G QSFP+, MMF, MPO, QSFP-40G-SR-BD, QSFP-40G-SR4 on June 3, 2016 by laura.